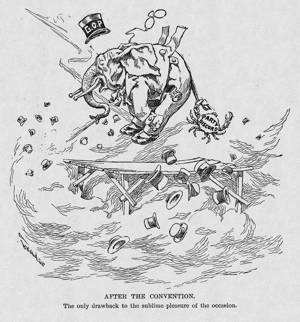 With hats flung in the air, Republicans celebrate the renomination of President Benjamin Harrison in this cartoon. However, the face of the catapulting GOP elephant registers pained alarm from the “Party Discord” crab attached to its tail. Although Harrison had won a comfortable victory on the first ballot, he was unpopular with important state political machine bosses, such as Thomas Platt of New York and Matthew Quay of Pennsylvania, as well as other party leaders. The combined ballot total of 40% for James G. Blaine, Harrison’s former secretary of state, and Governor William McKinley of Ohio, signified substantial opposition to the president within his own party, particularly from the key states of New York, Ohio, and Pennsylvania.